Ready to make a simple--but festive--Christmas planner? 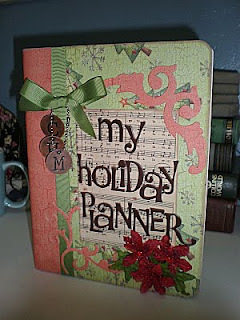 Here's an easy Christmas planner project from Kerry's Paper Crafting Blog! Can you make a Christmas planner from .... shipping tags? Yes, you can! Pocket pages, open on the sides, are gather together in an o-ring binding. Each pocket holds shipping-tag planner pages created with rubber stamps. Ready to make a list and check it twice? So is the happy blogger at the Littlest Learner's blog--and she's made it easy to follow along with this cute printable Christmas gift list! Littlest Learner's earned her organizing chops honestly, as mom, teacher, and author of The Clutter-Free Classroom Guide. 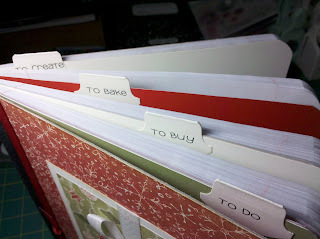 Now she shares her method for Christmas organizing, along with a sprightly printable for your Christmas notebook. Using calendar deadlines, she gets holiday planning and holiday prep moving for an organized Christmas. 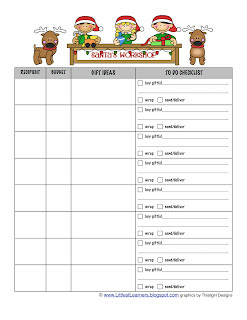 Don't miss the cute printable Christmas gift list! We love the bright elves and the simple--yet effective--form design. Grab it! Who'd have thought a non-traditional purple color scheme could be so endearing? 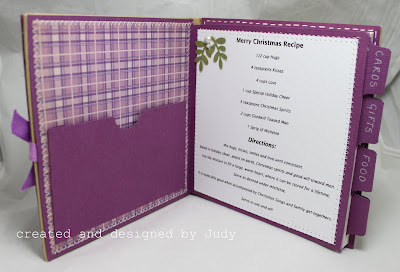 Built on a simple lined notebook, Judy's use of hand-colored stamped images, creative contrast matting and just-right embellishments makes this Christmas planner truly shine.